The Bathroom, Kitchen, Garage or outside outlets stopped working. These areas of your home have a special device called a G(round) F(ault) C(ircuit) I(nterrupter) receptacle which are very sensitive to moisture and water; required by the National Electrical Code, they create a safer electrical system for you and your family. They have the ability to protect many receptacles; meaning you only need a few in your home to protect those vital areas. If an outlet is not working in one of these areas, you should look around for the goofy outlet with a button in the middle and hit “Reset”. They are often behind a counter-top appliance, or a cabinet in the garage but, rest assured, they are there. Simply reset them and power will be restored. In living rooms and bedrooms, a wall switch often controls one of the sockets of a duplex receptacle. Either the top or bottom of the outlet will have power to it when the light switch is in the “On” position. The purpose of this setup is to control a lamp or illuminating device in a room without having to walk across a dark room to turn on a light. Please check both the top and bottom of the outlet if you are unsure whether or not there is power available. Circuit breakers are currently the most common type of overcurrent device used in homes today. These are found in the panelboards commonly located in garages and act like switches, turning on or off power for its respective circuits. Occasionally they trip (for a variety of reasons) and need to be reset in order to restore power. Breakers have three positions, “on”, “tripped”, and “off”. To reset the breaker, the handle needs to be pulled or pushed entirely to the “Off” position. There will be a physical snap when it sets in place. From there, you can push or pull it to the “On” position. Make sure that the handle goes entirely to one side and the other and doesn’t remain in the center, “tripped” setting. I have an outdated panel that has been mentioned as a fire hazard, should I replace it? Yes, these panels are outdated and are known to not properly protect your wiring inside your walls when overloaded. First call your power company and run your project by them. Once you have received approval from the utility company for your project Prairie Electric will be happy to provide a quote and coordinate the installation. Why Is My Smoke Detector Chirping? If you have a chirping smoke detector, it is most likely driving you crazy. The good news is it’s typically a battery that needs to be changed, which is a fairly straightforward process. However, if it isn’t a battery, then there are some steps you can take to troubleshoot your beeping detector. Here’s what to do when your smoke detector is keeping you up at night or chirping over important dialogue in your latest Netflix binge watching session. Find a ladder and a buddy to keep the ladder steady if your ceilings are particularly high. Depending on your smoke detector model, you may need to remove the entire unit or simply open the door on the detector to access your battery. (Most detectors use a 9 volt battery, but of course, this is something that should be checked before changing the battery). Remove the battery, and hold the reset/hush button to reset the detector. Replace the old battery and press the “test” button on your detector. If your smoke alarm was chirping because of a low battery, the alarm should sound briefly, letting you know the new battery is good to go, and you don’t need to take any further steps. If the alarm does not sound, try a different battery. If a second new battery doesn’t work, and you have a fairly new model of a smoke detector, you may need to reset the unit. Sometimes after you’ve changed the battery, the smoke detector may not register the new battery. To fix this, you’ll need to completely reset the smoke alarm. To do so, head to the circuit breaker and turn of the power in the room your smoke detector is located in, then head back in to your problematic smoke alarm. Unhook the detector from its bracket and unplug its power supply. Remove the battery and press down and hold the test button for approximately 20 seconds. Put the new battery back into the smoke detector, plug in and reattach the smoke detector to its bracket. Turn the power back on from the circuit breaker. The alarm should chirp once more, but the repeated beeping shouldn’t. If your smoke alarm continues to chirp after you’ve tried every solution, you may need a new smoke detector. If your smoke detector is over 10 years old, it’s definitely a good idea to get a new one. 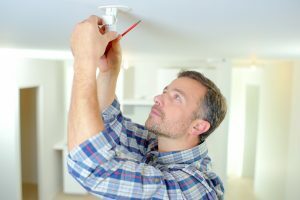 If you need help installing your smoke detector, or have questions about your home smoke alarm system, call Prairie Electric today.